The final stats from the recent Gears of War 3 beta are in, and the numbers are morbidly impressive. During the beta test's four week run, 1.29 million players from 145 different countries participated in 249 years worth of multiplayer games. According to Epic Games' tally, that's over 11 million matches. Even more impressive is the body count generated during the test. 927 million kills were recorded, 131 million of which were the Gears of War series' signature, hyper-violent, close-quarters "Executions." Another 23 million virtual folk met their grisly end at the cutting blade of a Lancer chainsaw. Apparently all this bloodshed must have been constructive as players managed to pick up 4.9 billion ribbons and 291 million medals. Most interesting however, is the total number of bullets fired during the beta. According to Epic's figures, players busted almost 23 billion caps at one another. If we take the number of kills, subtract the kills which were performed manually or with the help of unwieldy bayonet analogues, and divide that number by the total number of shots fired, we learn that each bullet had only a 3 percent chance of being a kill shot. This is where I scoff and sarcastically quip, "Nice shooting Tex." Despite their apparent inability to point the useful end of a gun at one another with any frequency, players seem absolutely smitten with the beta. 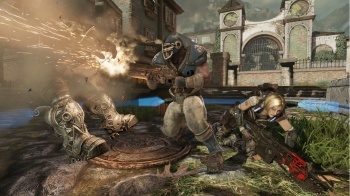 Pre-orders for Gears of War 3 (which hits retail on September 20) have set a new record for an Xbox-exclusive title, snaring the preemptive cash of more than one million fans. So far there's no word on how that impressive pre-order figure breaks down between the game's three distinct editions.